“A tender plea” is what the fine writer Harriet Choice calls this Sammy Cahn / Saul Chaplin song. PLEASE BE KIND speaks of the vulnerability of love — the way we say “Here is my heart” to the person whose love we gently ask for. When the plea doesn’t work, we could feel as if we’d painted an archery target on our t-shirt. But when neither person has arrows or bow, happiness is possible, blossoming out of mutual understanding. Kindness becomes the common language, enacted more than spoken. I’d heard many great versions of this song, by Mildred Bailey, Frank Sinatra, Carmen McRae — but this version, performed at the San Diego Jazz Fest just a few days ago (November 26, 2017) is slower, more tender, and infinitely more touching than any of the more famous ones. Dawn Lambeth sings it from her heart, as if it mattered, which of course it does. I’ve known Dawn’s music for nearly fifteen years, thanks to the blessed and much-missed Leslie Johnson, of The Mississippi Rag, who offered me a copy of her first CD, MIDNIGHT BLUE, to review. And from the first notes of “If I Were You,” I knew I was listening to a splendid artist: someone who understood the words, who knew how to swing, whose voice was a gentle warm embrace of the song and the listener. And although it might be rude to speak of an artist “improving,” the emotional riches Dawn offers us now are lasting gifts. Pianist Kris Tokarski’s little band is just spectacular — Kris on piano, Larry Scala (who set the magnificent yearning tempo) guitar; Jonathan Doyle, tenor saxophone — showing his heart utterly as well; Nobu Ozaki, string bass; Hal Smith, drums; Marc Caparone, trumpet. I know that comparisons are precarious, but this performance hits me gently where I live — as Louis and Lester do. Allergies are not the reason my eyes are suddenly damp. I hope you watch and re-watch this performance, that you go away with words and melody in your mind and ears, and that you, too, make the choice to be kind. It always counts. I’ve been waiting for this CD for a long time . . . and it satisfies! Not only does it have a sweetly spiky Modernist cover; inside the paper sleeve is some of the best swinging music you’ll hear. No hyperbole; no jokes. “What could cause Michael to make such extravagant claims?” one might ask. Well, some history. In the beginning of this century, I was reviewing CDs for The Mississippi Rag, a periodical I miss almost as much as I miss its editor, the sainted and funny and sharp Leslie Johnson. 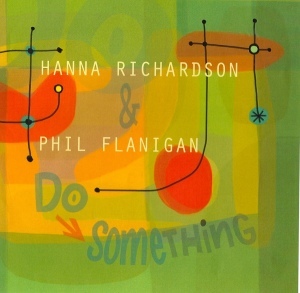 A new CD came to me featuring a singer I’d never heard of, Hanna Richardson, and a bassist I knew, Phil Flanigan. I put it on and was immediately happy: they swung without pretense, they improvised sweetly; they made fine melodies sound better, turning them this way and that to the light. Warmth without sentimentality was their goal, and they accomplished it on every track — often leavened with sly wit. Eventually I got to meet Hanna and Phil, to see them in the recording studio and to delight in their live performance. Then, through the Jazz Grapevine, news leaked out from a secret spot in upstate New York. Hanna and Phil had picked up electrified tenor guitars (four strings, no waiting) and had added them to the Richardson-Flanigan entourage. And videos started to appear on YouTube of a group they called — with tongue-in-cheek (but not so seriously that Hanna’s sterling enunciation was hampered) TENOR MADNESS. I rest my case. Ain’t they something? And now, Hanna, Phil (alternating between string bass and tenor guitar), Randy Reinhart (cornet), Stefan Vasnier (piano), Jared Mulcahy (string bass) have made what they used to call AN ALBUM . . . with the provocative title DO SOMETHING. The songs are THREE LITTLE WORDS (with the sweet verse) / FOOLIN’ MYSELF (where Hanna goes her own wistful way, not copying Billie) / WHAT HAVE YOU GOT THAT GETS ME? / THE VERY THOUGHT OF YOU / A PORTER’S LOVE SONG TO A CHAMBERMAID (where housework is the way to Romance) / THE LADY’S IN LOVE WITH YOU / ME MINUS YOU (with great wit — remembering Miss Connee Boswell!) / ROMANCE WITHOUT FINANCE (for the shade of Tiny Grimes) / TALK TO ME BABY (a twentieth-century realistic love ditty) / DO SOMETHING (a call to arms!) / I DOUBLE DARE YOU / SHOW YOUR LINEN, MISS RICHARDSON (where Johnny Mercer has never sounded so good). Not only does our Miss Richardson sound better than ever, but the band, the band . . . is a marvel — rhythm that you could use to walk to Florida, and Randy’s glowing cornet, suggesting Sweets Edison here and Bobby Hackett there. It is possible that my readers need this CD. Birthdays, Christmas, Hanukah, Thanksgiving, no occasion at all. It’s a beauty. Learn more (as we say) here. It will be held at the Mainstreet Bar and Grill from 4-8 PM, which is located at 814 Mainstreet, Hopkins (which I assume is in Minnesota): 952-938-2400 is the phone number, www.mainstreetbar.com, the website. There will be no cover charge, but donations to the New Orleans Musicians’ Clinic are encouraged. Of course there will be music: from Butch Thompson, the Bill Evans New Orleans Jazz Band, the Pig’s Eye Jass Band, Doug Haining and the Twin Cities Seven, and the Mouldy Figs. Maryann Sullivan, who hosts “Corner Jazz” on KBEM Radio, JAZZ88-FM, will host this event. Jody adds: “Currently the future of the RAG website is undecided. We are in the process of going through everything in the office, which we expect to take some time. Please check the website in late May for information about RAG’s future.” That website is, of course, www.mississippirag.com. Leslie gave so much to the jazz that she loved; it’s only fitting that she be honored to its strains. Freud, among others, points out that we all need love and work in equal measure to make our lives fulfilling. Fortunate are the people who can work with all with all their hearts at something they love and then share the work, the love, and the glorious results with us. We all benefit beyond measure — not just because of the results, but because of the inspiring examples these people offer us: models of how life should be lived. Leslie Johnson, who edited and published The Mississippi Rag for thirty-five years, was just such a person. I’ve written about Leslie several times in this blog — most recently, LESLIE JOHNSON, JAZZ HERO (January 15), and yesterday I posted the news of her death. It breaks my heart to write this letter and I know how hard it will be for you to read it. Leslie passed away Saturday afternoon, January 17, 2009. Leslie had five goals going into the end of 2008; completing 35 years of publishing the RAG with the December 2008 issue, enjoying Christmas with her family, sending a personal letter to the writers, writing a final letter to post on the website and sending the monthly email notification. Once all of the goals were completed to her satisfaction, she was able to let go of everything tying her down. Although we knew this day was coming, we were unprepared for how quickly it actually happened. Fortunately, the entire family was able to be there and the hospice staff made sure her time there was beautiful, peaceful and pain-free. For this we will be eternally grateful. 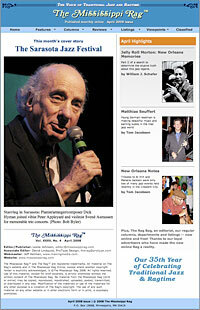 I have just learned that Leslie Johnson, editor and publisher and guiding spirit of The Mississippi Rag, died yesterday. Funeral arrangements are incomplete as I write this. Leslie spent her considerable energies taking very good care of the music she and readers of this blog love. She was and is much loved and she will be deeply missed. Jazz is full of people who burn brilliantly for only a short time. Then there are heroic figures who keep on keeping on for decades, selflessly giving. Leslie Johnson has been the editor and publisher of THE MISSISSIPPI RAG since 1973. Today I received an email from Leslie saying that she could no longer go on in those demanding roles because of her illness: she’s been fighting cancer for three and a half years. You can read her farewell at www.mississippirag.com., but I just wanted to add a few words that perhaps Leslie herself would read. I started to write reviews for the RAG in 2000, and became the paper’s New York correspondent in 2007. In the early days, I often picked up the phone and called Leslie when I had a question — because it was such a pleasure to talk to her, and because she worked such long hours putting out the paper that she didn’t always get to her hundreds of emails. She was fervent, cheerful, determined, and genuine. And I think she worked the longest hours of anyone I’ve ever encountered. For thirty-five years, mind you. It wasn’t for the money: operating a traditional jazz paper is not the Way to Wealth that Benjamin Franklin had in mind. It was because she loved the music, believed in it, and believed in the people who played it, those who produced the CDs, put on festivals, and wrote about it. She believed in jazz in a practical way. And this came through in the first conversation I had with her about the house style, or what she expected from reviewers. I don’t remember exactly how she said it, but she made it clear that hers was not a paper that delighted in putting artists down. To her, traditional jazz was having a hard enough time. Her paper’s mission was to celebrate and praise rather than to carp about faults. Fair enough, I remember saying, “But what if I think a CD is really an inferior piece of work?” Well, she said, she would return it to the musicians and say that she didn’t think the CD was up to their usual standard and the RAG would rather not review it. That was Leslie’s tough-minded kindness all out — and readers of the paper will note we reviewers were encouraged to tell the truth, but to check our razors at the door. Our phone conversations were also delightful for me — a born-and-bred New Yorker — because Leslie spoke what I think of as pure Minnesotan. I remember (and I can hear her voice now) responding to some statement of mine that she seconded, “That’s for darn sure!” It’s not a typical Manhattan form of agreement, and it gave and gives me great pleasure. I said above that Leslie believed in jazz. Many people I know would make the same statement of themselves, but their belief takes shape as pure enjoyment: “I believe in jazz, therefore I listen to _________ every night when I get home.” Leslie’s belief went beyond a set of speakers out of which music came, although she loved to listen to the music. It wasn’t an abstact reaction to jazz, either. She worked for thirty-five years FOR jazz, and the RAG has been the result, month after month. It’s been a privilege, and honor, and an education to work with and for Leslie Johnson — a true jazz hero. The April issue of the online Mississippi Rag has just appeared, once more testifying to the energy and devotion of its editor, Leslie Johnson, who has celebrated traditional jazz and ragtime for more than three decades now. You can read it for free every month by simply clicking on www.mississippirag.com., and why wouldn’t you? For a number of years, I’ve written CD and book reviews and profiles for the Rag, but this issue marks my first regular column covering the New York hot jazz scene — so I am especially proud to be there. I hope you’ll keep me informed on happenings in and around the five boroughs, and I know you’ll find something worth reading on every page. Onwards to May!